Chick Lit Central: Stephanie Elliot "Cells" us on her e-novella and has some to give away! 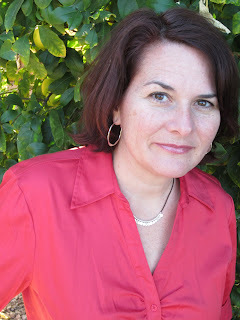 Stephanie Elliot "Cells" us on her e-novella and has some to give away! I met Stephanie Elliot back in 2010. I don't even remember the circumstances that brought us together, but suddenly we were talking about books and having a blast doing so! Her blog, MaNiC MoMMy (est. 2004), is one of the inspirations behind why I started Chick Lit Central in the first place. If you haven't visited it yet, go there NOW and enter her amazing giveaways. (She's also the inspiration behind why we come up with thought provoking bonus questions.) You can learn a lot about what makes her tick, as well. Stephanie and I both used to live in the Chicago suburbs and then we both moved to other parts of the country. So, she knows what it's like to live in a new place and have to start all over again. Lucky for her, she gets to hang out with Melissa P. (And Melissa P. is equally lucky in that regard.) Amy bonded with her over books right away when they also met through the blogosphere! Stephanie Elliot is a writer, editor and blogger who has worked, written, or edited for many places, including bettyconfidential.com, babyzone.com, parents.com, kaboose.com, Pregnancy, The Philadelphia Inquirer and Parents Express. She is also a Real Moms Guide blogger. Stephanie is a real mom to three really great kids and one very understanding and cool hubby. Her full-length novel, "Before the Beginning," is currently on submission with editors. She has lived in Tampa, Chicago, Philadelphia, Chicago again, and now Scottsdale. Stephanie has written her first e-book novella, "The Cell Phone Lot," and we're excited to share it with you, along with her guest post about taking risks. She's also giving away two e-book copies to some lucky readers anywhere in the world. Friend her on Facebook or tweet her on Twitter. You can also visit her newly updated website! 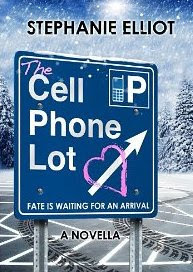 "The Cell Phone Lot" is my debut novella – a short story eBook (65 pages to be exact) about two people who randomly meet in the cell phone lot at the airport. Grant is there to pick up a woman he’s been corresponding with online, and they’re finally meeting in person. Bridge is there to pick up her sister who’s just been dumped by her boyfriend. Two random people who would have never met otherwise meet at a time that’s totally inconvenient for the both of them. Will they take a risk and fall in love? That’s why you need to read this little story to find out! And at just 99 cents on amazon.com, that’s cheaper than ANYTHING you can buy practically anywhere these days! I took a risk 22 years ago when I met my husband. Twenty-two years ago to the day in fact. On February 2, 1990, I met Scott in a bar in college. We were attracted to each other that very first night we met. We ended up sharing a table, a pizza, a dance, and later, many kisses. Now we’ve shared over half our lives and we have three awesome kids together. And all because I took a risk with him when we first started dating. After two weeks of hanging out, Scott suddenly stopped calling me. It was right around Valentine’s Day and I wondered if it was because he didn’t know if he should do something “Valentine-y” for me – after all, we had only been ‘hanging out’ for a couple of weeks. Maybe that’s why he stopped calling. Well, I didn’t want that. I liked him too much. So after waiting it out, after moping around that he didn’t call me over the Valentine holiday, I took a risk. I called him. And then we saw each other that night. And, aside from one nasty little break-up a year later when he needed to “put the relationship on the back-burner,” we’ve been together ever since. And I owe it all to the risk I took in calling him. I may be taking a risk in this publishing endeavor too, but in all things in life, if you want something, you have to make it happen. I wrote this little story and wanted to share it with people. I have an agent, and a full-length book I wrote is on submission with editors currently. I have no idea if that one will see the light of day. I would love for it to be sold to editors, to be published traditionally. That’s my ultimate goal. But in the meantime, I thought I’d take a risk and put "The Cell Phone Lot" out there. I’m testing the waters with the self-publishing eBook thing. I’ve never done this before, and so far it’s fun, and there are tons of awesome people out there in the author/writer/publishing/book reviewer/blogging world who are willing to help spread the word for people like me. It’s really cool, and I’m very grateful. Life is all about risks, and taking chances. Who knows what will happen? Who knows what will happen with this little story about two people meeting at the most inconvenient time in their lives. Who knows what will happen when you see that cute guy in the bar? Who knows what will happen if you let that novel free that you’ve had in that drawer for far too many years? Who knows what will happen if you sit down to your computer and type that first sentence to the novel you’ve always wanted to write? Who knows what happens unless you take a risk and make it happen. You only know what will happen if you don’t do anything. Nothing. Thanks for stopping by to learn a little bit about "The Cell Phone Lot." And thanks to both Melissas and Amy for hosting me on Chick Lit Central! I’d love to give away two eBook copies of "The Cell Phone Lot" here. Leave a comment here describing a risk you’ve taken or a risk you would like to take. Also, you can also stop by MaNiC MoMMy to enter to win, as well! Special thanks to Stephanie for sharing her guest post with us and her e-book with our readers! I made the risky decision to move to a different province (I live in Canada) with my boyfriend after only 4 months of dating. It was for a job opportunity for him, I was ready for a change and cared for him enough to give it a try. He wouldn't have moved if I hadn't agreed to go with him, but I'll never know if our relationship would have survived if this move hadn't happened. 11 years later, we are still together, married for 7.5 yrs, and we have 2 beautiful children! A risk I would like to take is to write for magazines or on line articles free lance. I have a friend who is currently employed this way and I remember having a coversation with her once way back when she suggested I do it because I read and am better with vocabulary " her words". She's doing it and I'm not lol! So excited about Stephanie's new book! Thanks for the giveaway! I've tried to take the conventional route, but it's never worked for me. So, I've always been a risk taker. Sometimes it works, other times it doesn't. But the one things that's ALWAYS TRUE is if you don't go for it, IT NEVER HAPPENS, SO GO FOR IT! Thanks Steph! writeoncindy(at)yahoo(dot)com I'm a CLC MEMBER! I guess the biggest risk I ever took was to choose to be a single mom. I chose to have and raise my son completely alone. And, yesterday he turned 28! A risk I took was applying for a job across the country. I ended up getting offered the job on the spot and said yes. It's been my favorite job ever since. I liked hearing the inspiration for your book. The book sounds very good. I have to admit that I don't think I've been much of a risk taker, but at the same time, if I see something I want, I tend to go after it. So, I have not been (too) afraid to make the first move with a man (although that generally has not worked out). What risk would I like to take? I hope that if a really amazing experience presents itself, that I will just go for it instead of giving into the fear of the unknown. I once travelled to a city I'd never been to in a different state by myself just to go to baseball games. A risk I've taken is going sky diving, twice. A risk I would like to take is establishing myself as a freelance writer. Can't wait to read Stephanie's book! Winners of "The Angel at No. 33"
Winners of "The Last Blind Date"
Joining the 700 club with a giveaway! Winners of "Outside the Lines"
What's in the mail today? Plus a giveaway! Winner of "I've Got Your Number"
Winners of "MWF Seeking BFF"